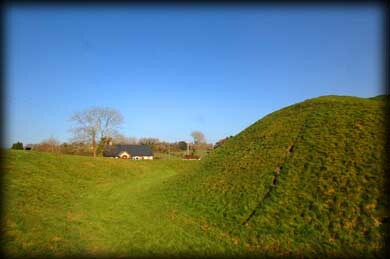 This Motte is located directly beside the main entrance to St Mullins monastic site. Although strategically placed overlooking the Barrow river, it is certainly one of the most beautiful locations I have seen for an Anglo-Norman Motte. 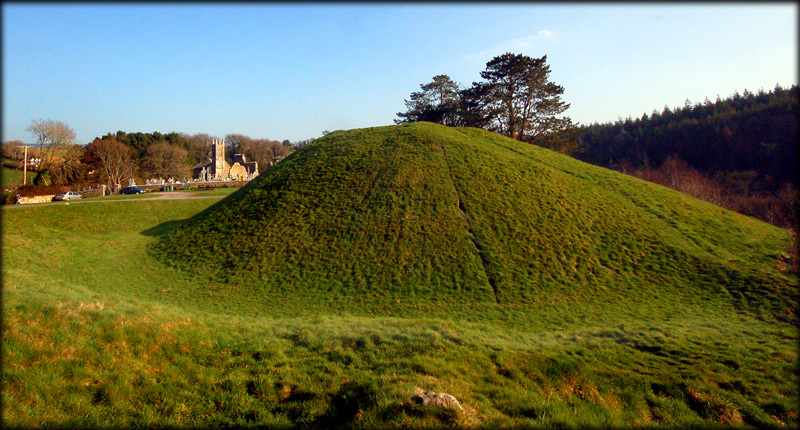 The mound was built around the later part of the 12th century when Richard De Clare (Strongbow) granted permission. The Fosse, pictured right is very deep. The remains of an extremely long Bailey, pictured below, can be seen running north west from the Motte. This was where the castle's Garrison and Household were located. Unfortunately the bailey has been damaged by quarrying. Situated: Very Easy. 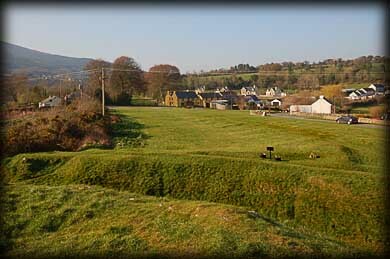 As you head towards entrance St Mullins monastic site, the Motte is located on the opposite side of the road. Discovery Map 68: S 726 380. Last visit March 2011.